The American capitalist Cornelius Vanderbilt was born near Stapleton, Staten Island, New York, on the 27th of May 1794. He was a descendant of Jan Aersten Van der Bilt, who emigrated from Holland about 1650 and settled near Brooklyn. The family removed to Staten Island in 1715. At the age of 16 he bought a sailboat, in which he carried farm produce and passengers between Staten Island and New York. He was soon doing a profitable carrying business, and in 1813 carried supplies to fortifications in New York Harbor and the adjacent waters. Recognizing the superiority of steam over sailing vessels, he sold his sloops and schooners, and in 1817-29 was a captain on a steam ferry between New York and New Brunswick. In 1857-62 he sold his steamships and turned his attention more and more to the development of railways. In 1857 he became a director, and in 1863 president, of the New York & Harlem railway company, operating a line between New York and Chatham Four Corners, in Columbia county, and he greatly improved this service. 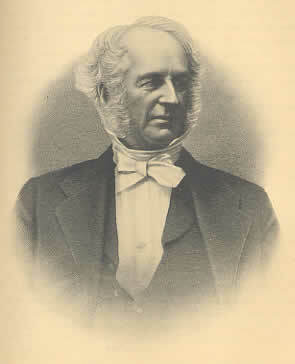 He then acquired a controlling interest in the Hudson River railway, of which he became president in 1865; and after a sharp struggle in 1868 he became president of the New York Central (between Albany and Buffalo), which in 1869 he combined with the Hudson River road, under the name of the New York Central & Hudson River railroad, of which he became president. His acquisition of the Lake Shore & Michigan Southern railway in 1873 established a through line (controlled by him) between New York and Chicago. At the time of his death (in New York City on 4 January 1877) he owned a majority interest in the New York Central & Hudson River, the Lake Shore & Michigan Southern, the Harlem, and the Canada Southern railways, and had holdings in many others, and his fortune was variously estimated at from $90 million to $100 million, about $80 million of which he left to his son, William Henry. He made considerable benefactions to Vanderbilt University, and gave $50,000 during his life to the Church of the Strangers in New York.